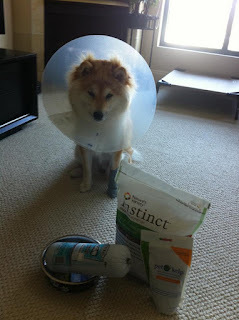 After our last vet visit, I've been on a mission to provide Maya a better diet in hope to cure her allergies. A lot of Shiba owners suggested to feed a fish-base kibble, because it's what their ancestors had been eating and closer to their natural diet. I switched Maya over to Orijen 6 Fish, but despite all the good reviews, she never really liked it. Sometimes she would leave her entire breakfast untouched till I got home in the evening and would only eat a small portion of her dinner. Her stools were also very loose and smelly. This diet is obviously not ideal for her, so I went back to research mode to look for better food options. Ever since I started looking for a puppy, I've heard a lot of good things about raw diet, but I never had the urge or incentive to try it. It seems really time-consuming to prepare, and balancing all the different nutrition seems complicated. However, after reading so much success stories from pet owners about curing their little ones by switching to raw, I made up my mind to give it a try as well. Even if it doesn't "fix" Maya, I believe she will still enjoy the food. (She has always been a big fan of raw meat.) At least we can boost her appetite and make her happier. Because I'm not quite ready to prepare my own homemade raw, I decided to start with some premade frozen diets. 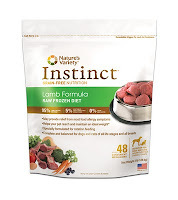 For her meal base, I picked Nature's Variety's "Lamb Formula". Nature's Variety have a lot of good reviews and lamb seems to be a safe choice. 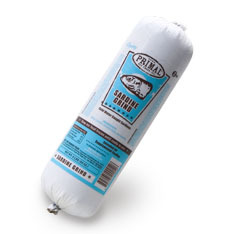 I still want her to have some fish everyday, so I also got of a roll of Primal's "Sardine Grind". (I wasn't able to find a complete meal formula that is fish-based among the top rating brands.) I also mixed a raw egg (with shell), baby carrots, cabbage, and some pumpkin squash with a blender, and freeze into small ice cubes to add as supplements. Day 1: Gave her one lamb patty mixed with kibbles for breakfast. She gobbled up the food without even chewing. For dinner, some sardine grind with kibbles and wet food (was used to mix with her kibbles, have about 1/4 can left, so might as well finish it up). She ate it all and enjoyed it. Day 2: Two lamb patties mixed with kibbles. She ate all the lamb meat first, then went back to the kibbles. For dinner, a bit more sardine grind with a bit less kibbles/wet food. Also added some fresh veggie mix. She ate everything except the kibbles, and refused to eat them even when I try to feed her by hand. Day 3: I was planning to take longer for the transition, but since she refused to eat any dry food anymore, I stopped give it to her. Breakfast: three lamb patties. Still loved it. Dinner: sardine grind with the remainder of her wet food, veggie mix juice (melted the frozen ice cubes), and a bit more pumpkin mix (because she had very loose stools). Sadly, she turned her nose up and wasn't interested in it at all. I realized the food was probably a bit too watery with all the juice, grind, and wet food, and the portion of veggies might be too high. She eventually ate some when I fed her by hand, and she seemed to enjoy eating the veggie mix more as ice cubes instead of juice. Day 4: Since she loved her breakfast and wasn't that interested in her dinner the day before, I decide to mix them up. So for both meals, she got one and a half patty, some sardine and some veggie mix. The only difference is that the veggie mix I gave her in the morning was still frozen but was melted in the evening. Somehow she gobbled up her breakfast but wasn't really interested in her dinner. I'm not sure if the frozen/melted veggie mix made such a big difference or maybe she's just not hungry. I'll need to do a bit more experiments on that. Her poop also seems to firm up a lot, which is a really good sign. For now, I think I'll stick with this meal plan and maybe play around with the veggie mix. Once things are more stable, I'll start gradually adding more supplements and introduce different types of meat. Eventually, I would like to prepare her meals myself to reduce the cost (premade raw are super expensive) as well as have more control of what she eats. Meanwhile, I've been gathering information, looking for meat sources and preparing myself to make the switch.